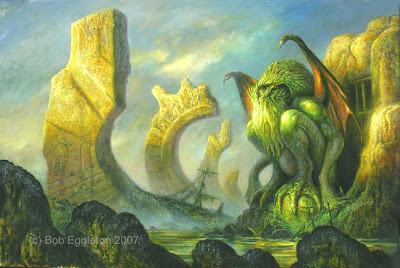 OR...as we say from The Land of Lovecraft(Providence) NAH-FUYAGGA SCRIIIYANG!!!! (Official translation done at Miskatonic University). 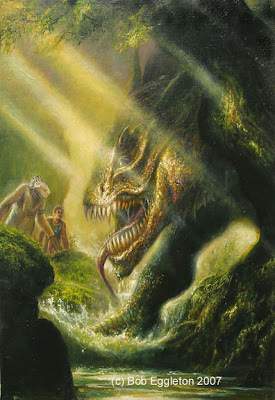 Here's that BIG Lovecraftian oil painting I did-more than inspired in content and lighting, by both Gustave Dore and Arnold Bocklin, of the Unamable One(not on Halloween will I even dare utter his true name lest I invoke his slimey wrath!) 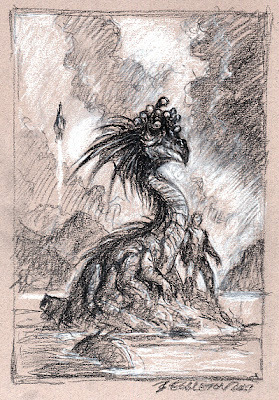 for the Brian Lumley(I can name him okay) book coming from Subterranean Press and Solaris Books(Brian's UK Publisher) for the MYTHOS 2 collection. Enjoy and take your ghoul to dinner, just make sure YOU aren't the dinner. I did something this week I haven't done in ages. I worked basically marathon from Sunday...to this Sunday, developing ideas for paintings, working on a contracted book project's sketches, and finishing a major-wraparound painting. I really worked at this, in this last week spending more time in the studio-dawn to dusk-than I have ever in a long while. One of the worst attributes of artists are working habits. We love what we do. But life-and errands, delivering things, going to the post office, getting frames,picking up your mom from a trip to England-all just get in the way. 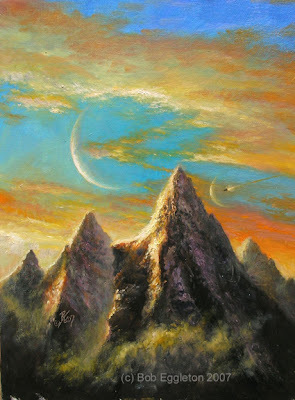 Today I did one last push to finish up this major painting-it's a Cthuhlu in oils-but as with many of Brian Lumley's books I had a blank check creatively, which means I can do more or less, what I wanted. So, I did an epic. I stepped back from it today-after feeling like I was in an isolation room-and realized the piece was finally done. It's caked with oil paint, scraped on, brushed on, stabbed and daubed on-the way I like it. But it's done and I'm really completely exhausted...beat in fact. The nice part, of this kind of work is that while working on one painting, it generates ideas for at least six more. So I have to jot them all down in visual shorthand. Maybe I'll post those-they're VERY scribbly. I have some great paintings to come, and 2008 will be the year of more personal work. 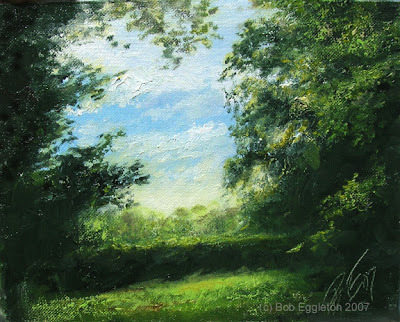 2007 was the year of working in oils-a resolution that as we inexorably tumble toward 2008 in a little over eight or nine weeks-I acted upon. This week involves getting ready for the World Fantasy Con in Saratoga Springs, NY next weekend. No rest for the weary. I managed to lay down, for a few minutes and let Halloween songs run over me, from The Lost 45's , a radio show from Boston that plays music you never hear anymore. Tonight was Halloween music- Rocky Horror-The Time Warp, Michael Jackson-Thriller,Ray Parker Jr- Ghostbusters, Bobby Boris Pickett-The Monster Mash, Warren Zevon-Werewolves of London...etc etc. A nice relief from the intensity of painting intensely. Some visual stuff this week, I promise. In the meantime I think I'll watch The Paul Lynde Halloween Special from 1976-Oh-my-Goodness!!! Seems my comment on digital(while I am toiling away on a massive oil painting you will see in the next week...) aroused some fine discussions. It always does. At SF cons many artists refer to "Originals vs Digital" panels are like a can of worms to the point that at the end of it, one asks oneself what the arguement really is? Digital does some amazing work esp for films-conceptual art through the finished product. Just look at TRANSFORMERS...amazing, utterly. I'm anxious myself to do more "dabbling" like that because it begs to have it's own properties explored. And as I said...what is art but EXPLORATION of ideas and those ideas... EVOLVE...(I'm not yelling, just talking in Big Capitals!). Once I get through with this oil painting maybe I can...do..oh, another oil painting..and...well, you get the picture(pardon the pun). Both media take one ingredient that people often forget-talent. There are some amazing, genuinely talented people who's style transcends the medium. Still, when you get to corporate ladders, you get people who have no clue that it all just doesn't happen "by pushing a key". No... it takes artists, model builders, designers and so on to make it all come together. Digital is just another tool in the box to use. And when you all make it work you have the happy medium. Just thoughts for today. Pictures to come. I got several comments in the last blog entry-it has been out and out crazy with things this week, so nothing new-but I felt I wanted to re-assure people I'm not "going digital". The problem I have with CG or digital art is the basic idea that, it has no "original". Also, I like the tactile feel of paint going onto canvas. The inherent problem with digital art is that it stems from the use of the same programs. In other words, no matter where you go, there you are-Photoshop looks like Photoshop, and so on. And I have alot of this stuff onhand anyway-I have a nice Wacom tabet that I have yet to fully use. Which brings me to the next issue-the money spent on software that is constantly in a state of update to the point that unless one backs up one's work on new storage hardware, then eventually the older work will not be accessible. But not to worry, I would never give up painting-I'll be one of the "dinosaurs" myself if that be the case. So far, I must be doing something right. What a week it has been in terms of some work and catching up. Mostly a book project that involved dinosaurs and my first foray into digital art. However, there were so many scenes and images in my head to paint from the recent trip to England, that I made sure to do one once a day. And, as I said, pictures will be posted in groups now, it's just easier overall. The song "Whiter Shade of Pale" by Procol Harum, I can always associate with a visit to England. Maybe now it's because I have a friend who sat in while the song was being recorded in 1967, and she has some good stories about it. 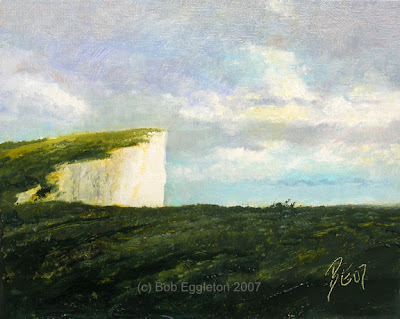 Maybe it's because it reminds me of the White Cliffs of Dover, in the south, near Beachy Head, kind of not far from Eastbourne that, I seem to recall hearing on a car radio when I was at this very spot in 1971. In WW2, great battles between British Spitfires and the German Luftwaffer took place right around here. What is immediately striking is the fact these giant cliffs are just sheer-straight down and made of chalk. There are no fences as what you see when you approach the edge, that darker area in the forground, just drops right off!!! People have actually driven their cars right off the edge in the fog. It's almost surreal to see this. And the effect of sun on them is striking-clouds form shadows so some areas are slivers of bright light, and others, darker. And, at the bottom-to give you a sense of scale, is a lighthouse. Don't worry, I'm not going into Thomas Kinkade territory! The bottom piece is some of the lovely Fall colors at Cockington Park, not far from Torquay. Enjoy! If you like one, and would like to buy, please tell me the title of the piece and we'll go from there, as I said last time. 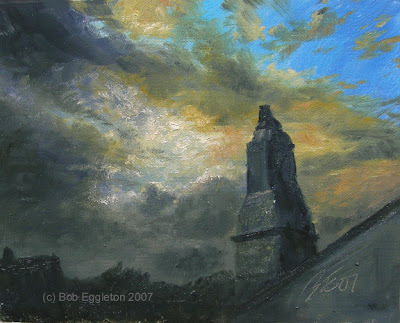 The top painting features the chimney and chimney pot of a house, against a Constable-like sky. I always describe weather in "artist" terms. The bottom piece shows a curtained effect that many Hudson River Painters did, as did some of the Romantic English ones. Gives one the feeling of being "in" the protection of the trees. 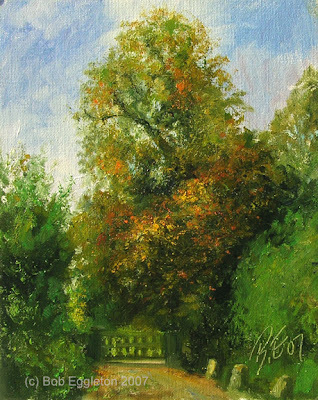 A note-I plan to post paintings as I do them, in groups sometimes. So if you want one, please specify not the post but the particular painting you like and we'll go from there. 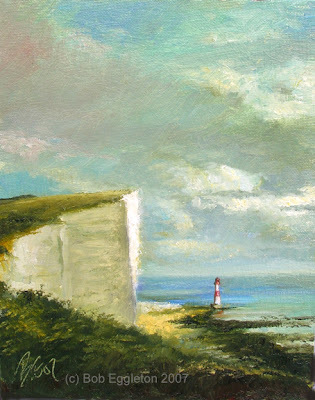 I will be getting back to more paintings as I get close to Xmas time, as they make great gifts for people(hint). Here are three paintings I did for the upcoming Subterranean Press edition of HUNTER'S RUN by George R.R. Martin, Gardner Dozois and Daniel Abraham. 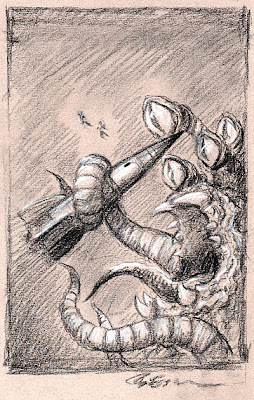 It's quite an adventure on an alien world with (at one point) an attack from a creature called the Chubacabra. I always like these special edition books as it always gives me more freedom to do some interiors and some straightforward SF(or fantasy or horror) artwork. Look for it around January, or go to http://www.subterraneanpress.com/ and pre-order it and take a peek at some of the other fine books they put out. Subterranean Press produces some of the most beautifully designed and printed books I have ever seen and am proud to be part of. It was a busy busy weekend, one of the rare times I worked fully on the weekend just to catch up from all the travelling. The Good news is that everything got done, but the bad news is that I haven't posted much here. I fully intend to get back to small paintings, but I had so much work and catching up and a couple of social engagements to take care of, that I'm quite exhausted. And I was just getting past jetlag!!! A quick film plug. 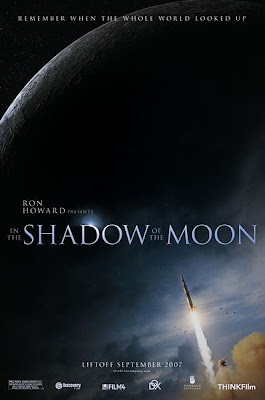 Saw IN THE SHADOW OF THE MOON, a terrific documentary, presented by Ron Howard and directed by David Sington, takes us back to the years of 1968-1972 and the Apollo moon program. It's told via some amazing-rarely seen footage-and present day interviews with former Astronauts-Buzz Aldrin, Gene Cernan, Mike Collins, Alan Bean, and others. I got misty eyed watching this!!! Via footage, newsclips(including Walter Cronkite and the animated CBS News "Man on The Moon" graphic complete with a Kellogg ad) we literally feel transported back to those heady days. The astronauts tell things just like they were. Mike Collins is the funniest and candid, Gene Cernan is the most thought provoking and Buzz is...well, he's Buzz! What gets you is how you see all these other nations waving American flags and saying "If any country could do this, it's America!". Wow. Those were the days. For me, it made me very wistful and I had a flood of memories of everything I did at that time, in 1969 when we waited for the Eagle to land on the moon. I could almost quote Walter Cronkite and Mission Control word for word. Told alot about what was going on in the 1960's and made me very thoughtful about why the public just lost it's imagination after the first moon walk. And how, in preceding years, idiots and conspiracy nuts have come along to try and say we never went to the moon. As Charlie Duke says in the film "If we faked it, why'd we fake it six more times???". Well said. The filmmaker's apparent only disappointment was still not being able to get Neil Armstrong on camera to speak about what he did. And in the very end, one funny credit reads "No Computer Graphics were used in making any sequence in this film" . Overall, this is one truly amazing documentary. Go see it- before it leaves the theaters-soon! A couple of covers I am working on. The top one is a collection of slightly funny SF stories, by Ben Bova. I sort of had an open idea on this one because when you have a selection of stories it's hard to do any one image. The bottom is for a Heinlein re-issue called BETWEEN PLANETS and is alot of fun to do. Enjoy! 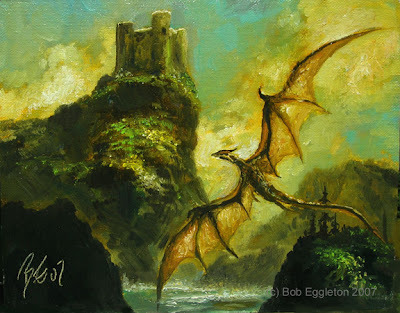 Actually, it's "the Lake Dragon" and I did it as a wedding present to two very good friends of mine who were just married last Sunday in a beautiful ceremony-perhaps the nicest I have attended as it was so open and areligiously done. Anyway, they like my dragons so I wanted to give them a dragon. Hence, it's not for sale obviously. But it's a painting for you to enjoy, as I enjoyed painting it! !